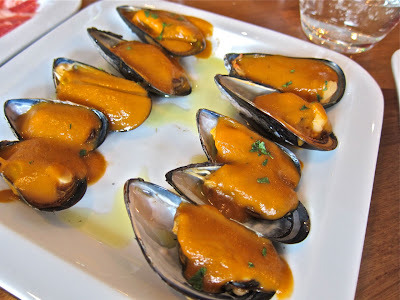 Ever since my trip to Barcelona last year, I've been dreaming about the tapas. I had joyful, unforgettable meals at places like Tapas24, Bar Mut, and La Cova Fumada. I've tried tapas in Prague over the years, but I never found anything that kept me coming back for more. When I got the tip that a real Spanish tapas place had opened, I got there as quick as I could. 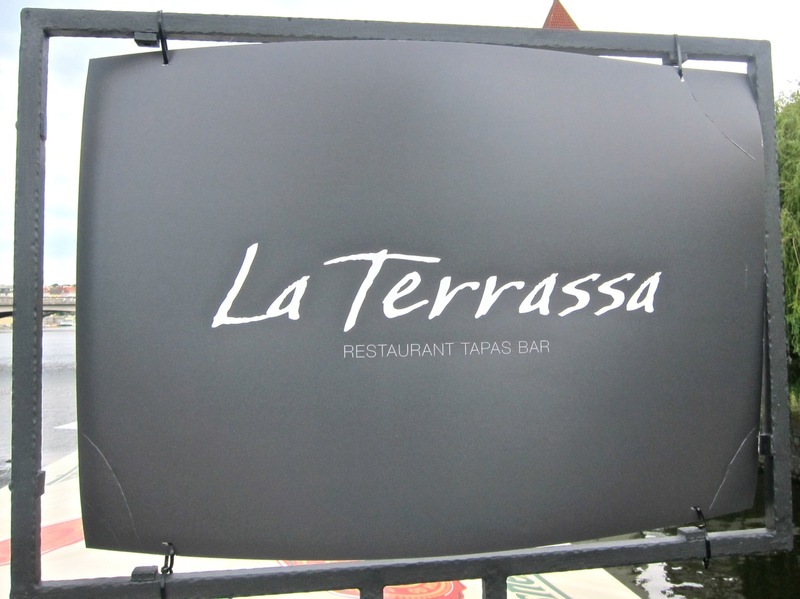 La Terrassa has a great location on the Vlatava, straddling the pointy end of Dětský ostrov (Children's Island). The restaurant is opposite the Dancing House, also known as Fred and Ginger. I took the tram 10 to Zborovska and walked about 10 minutes to get there. 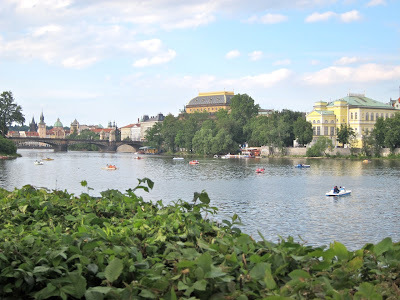 One could also take a tram to Arbesovo náměstí, which is about the same distance away. There are several options on where to sit. 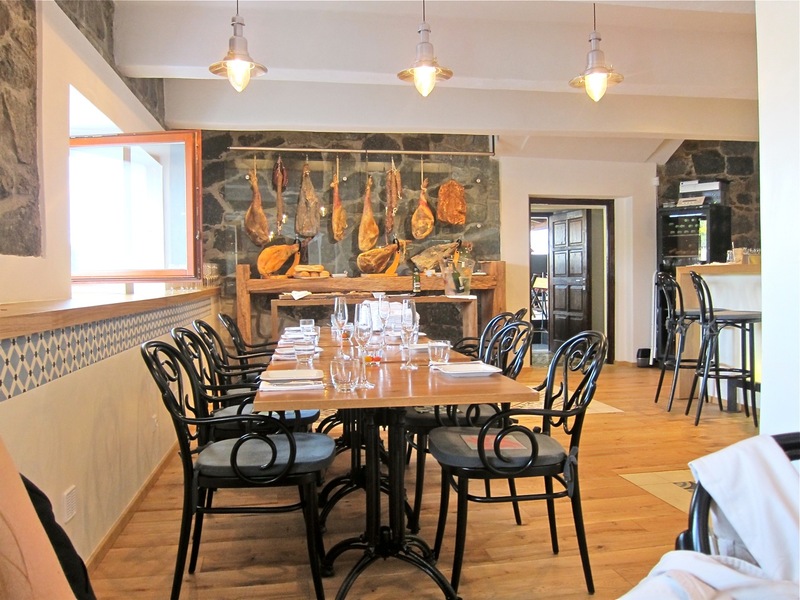 One is an attractive indoor space with blond wood floors, rough stone walls and hanging hams that convey both a modern and rustic feeling. Taking up one side of this room is the open kitchen. There you can watch chef de cuisine David Diaz at work. He's got a serious CV, having worked at Michelin-starred and the Ferrán Adrià-connected Telaia Mar in Barcelona. We ate here on the first visit and enjoyed watching the cooking show. First off, we received bread (35 CZK). It has a fresh and fluffy interior surrounded by a floury, crunchy crust. Great stuff. 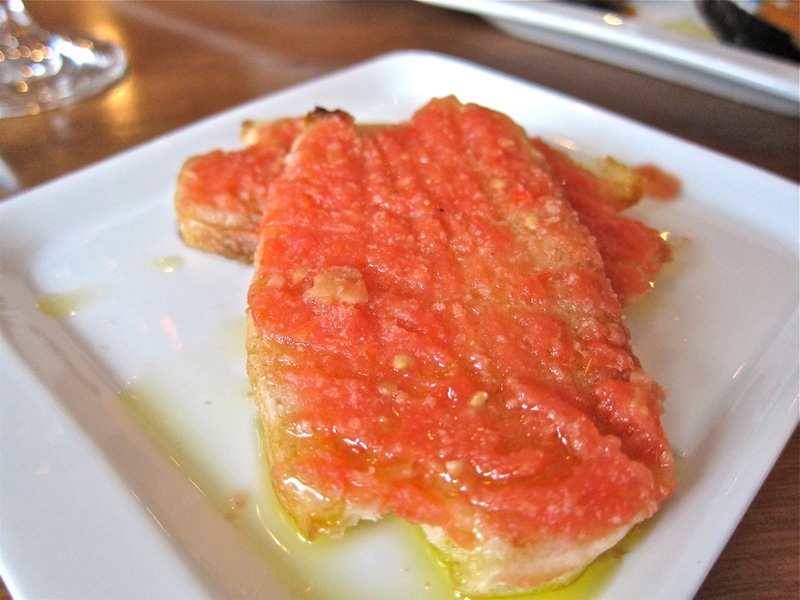 One of our favorite bites in Barcelona was also one of the most simple: the pan con tomate -- bread with tomato. We ordered that, hoping to be carried back to Catalonia (45 CZK). There is more than one way to make this, but this was not my favorite way. This one was done with a tomato puree, olive oil, and garlic on small slices of toast. Unfortunately, bread was soaked through and soggy. We also thought it was too garlicky. I much prefer the version we had many times in Barcelona. It was made on a special bread that looks like this. Pieces of tomato and garlic are lightly rubbed into the rough texture of one side and it was drizzled with olive oil. 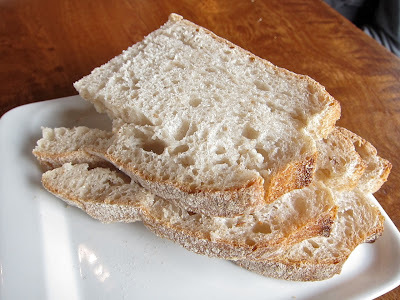 I had pan con tomate recently at Jaleo in Washington DC and they actually imported this bread from Barcelona. I wish they could do that here. 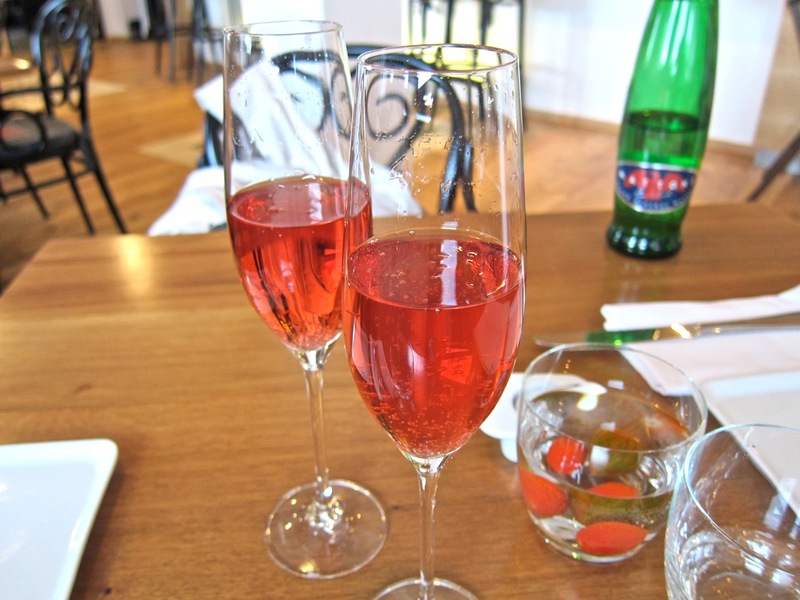 To drink, we ordered glasses N.V. Paul Cheneau Cava Rosé (95 CZK). 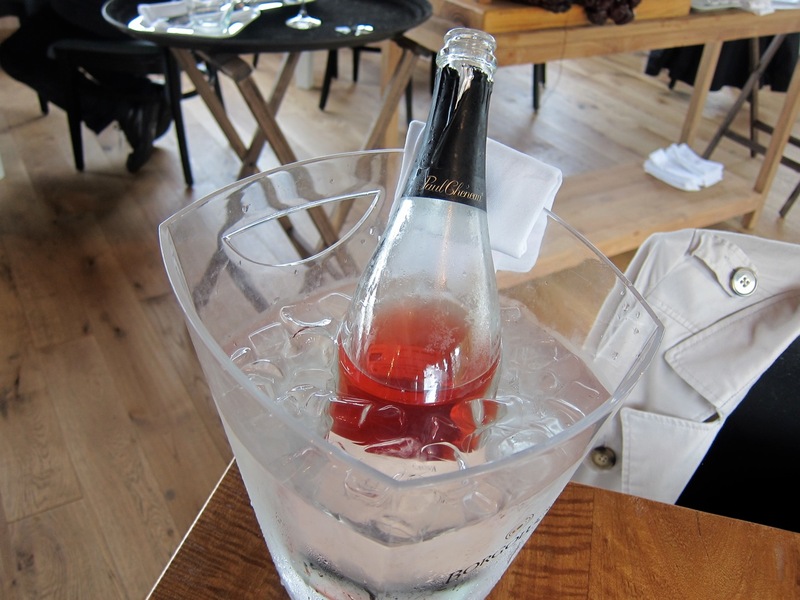 We liked its strawberry notes so much, we kept the whole freshly opened bottle (535 CZK). 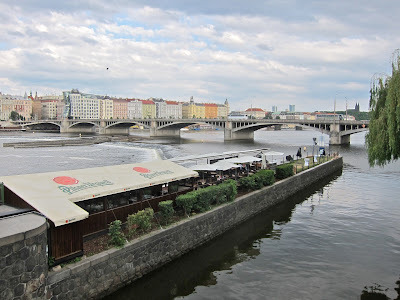 We also had a large bottle of Mattoni mineral water (65 CZK). We got a plate of mussels (125 CZK). They were fresh and meaty and coated with a lightly sweet, red peppery sauce that we both liked. We tried the Galician octopus (235 CZK). 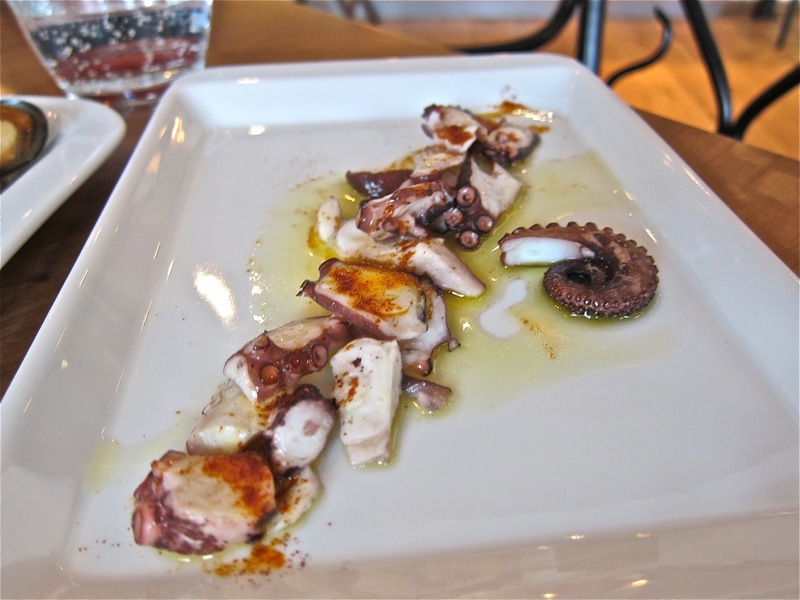 With this preparation, the octopus is boiled and then seasoned with paprika, salt and olive oil. The flesh was tender, but the flavor not so remarkable. What was remarkable was the big price for this small plate. We didn't think it was worth the splurge. 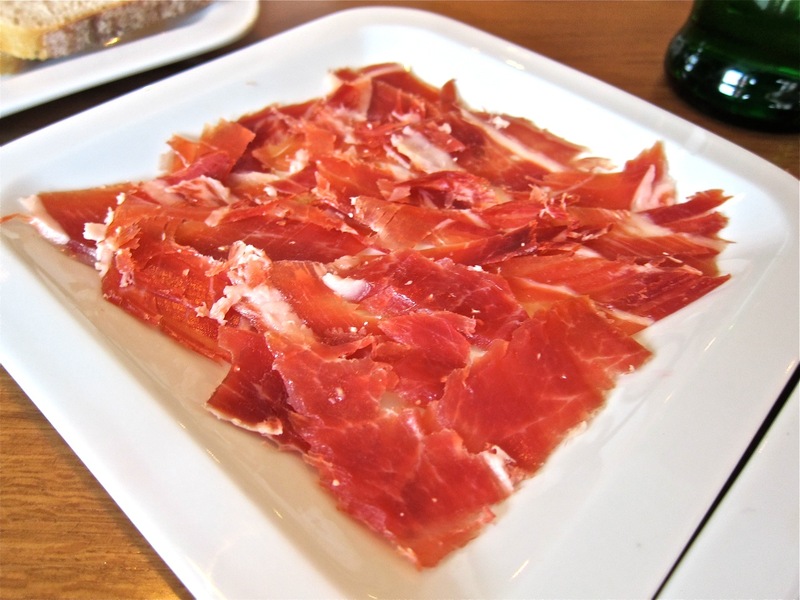 On the other hand, we both greatly enjoyed the Jamon Iberico de bellota (145 CZK). It was freshly carved, tender, and not too salty. My Italian companion eats grilled vegetables any chance she gets. We ordered two plates (65 CZK each). Though small, the veggies were done just right, with a lovely char on them. 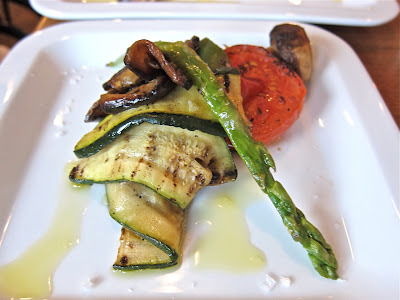 There was zucchini, asparagus, mushrooms, aubergine, and tomato. We decided to sample the larger meat and fish dishes. I had the Galician beef (450 CZK). The thick, tender piece of quality meat was served rare. 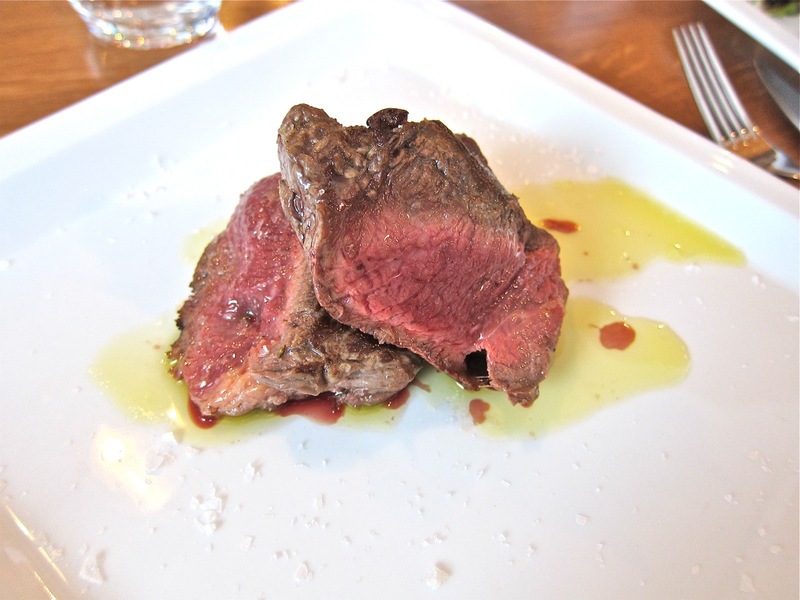 It was simply prepared with salt and olive oil. It didn't pick up much flavor from the grill. My date got the sea bass with fennel sauce (390 CZK). 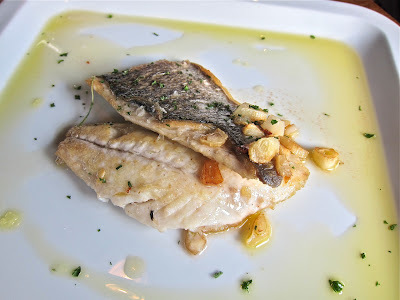 This was a great piece of fish, with a crispy skin on top and moist, delicate flesh below. The sauce worked well, even though the fennel flavor did not come through clearly. 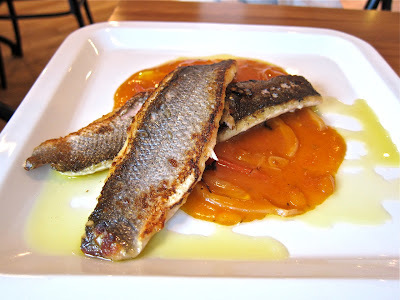 I noticed the sea bass was not on the Internet menu as I was writing this and some of the prices have changed. They did tell me on one visit that the restaurant is new and the menu is still evolving. For dessert, I was in the mood for chocolate, but there was no chocolate on the menu. 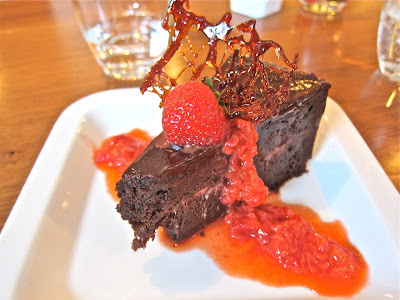 I mentioned this to the server and was told they did have chocolate cake (75 CZK). This one was fudgey, spongy and rich, with fresh but somewhat sour strawberries between the layers and on the side. I liked it. Our server was really nice and always smiling, though sometimes confused by the many different plates coming and going. We did see our veggies under the heat lamp for much too long. 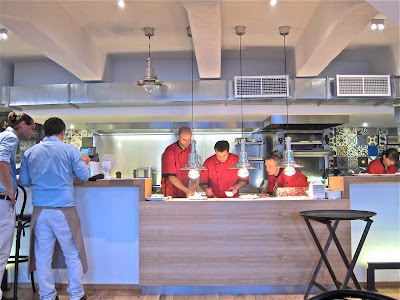 Also, it's normal to see chefs sample their work, but we were a little surprised to see several chefs eating what looked like full meals as they cooked. The tab for this outing, which included a bottle of cava, came to 2185 CZK before tip. While there were some misfires, we liked enough of what we tried, plus the vibrant atmosphere, to look forward to a second visit. We returned a few days later and sat in the second dining area, which looks and feels like the inside of a wooden ship. 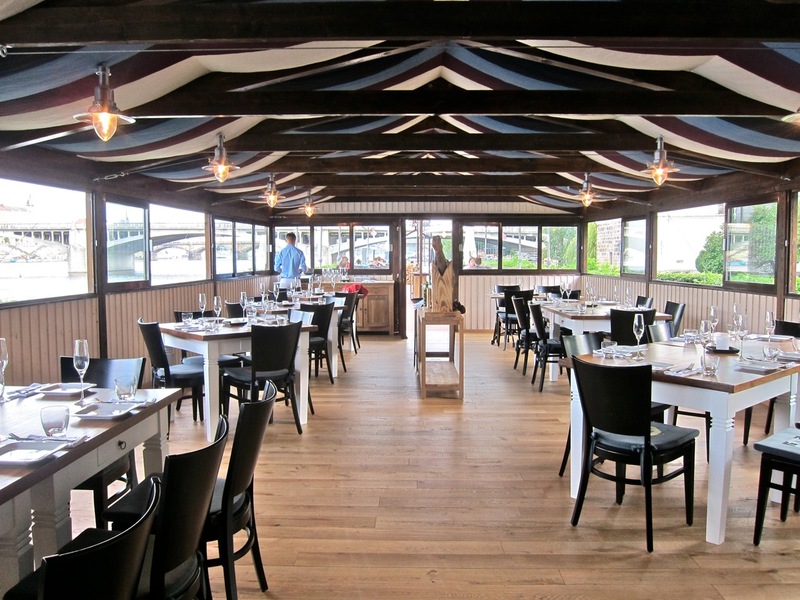 The blue and cream cloth between the beams in the ceiling, the wooden floors, the many windows, and the white tables give it a light, airy atmosphere. 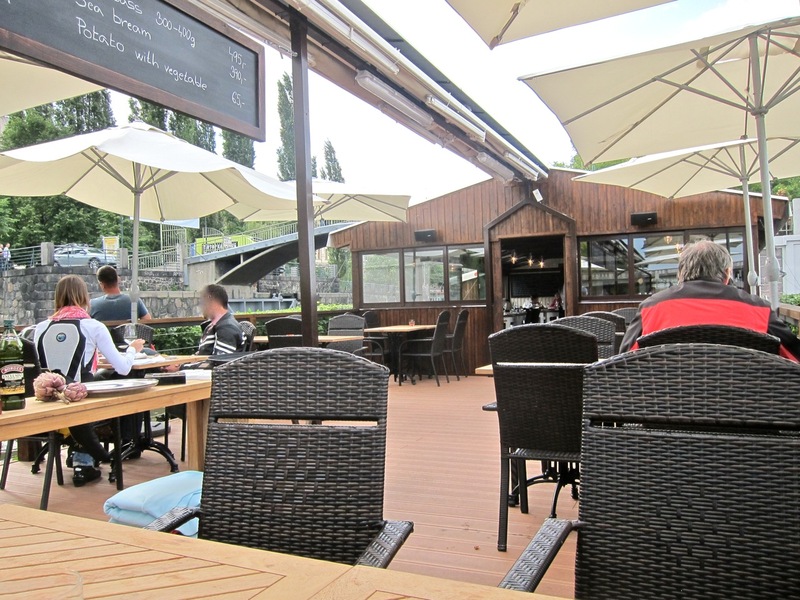 The two dining rooms are non-smoking, but smoking is allowed on the outside terrace that covers the end of the island. From here, you can get unobstructed views of the river and the National Theater. We ordered another bottle of the cava we had on the first visit. The waiter gave us a dish of seriously tiny olives. 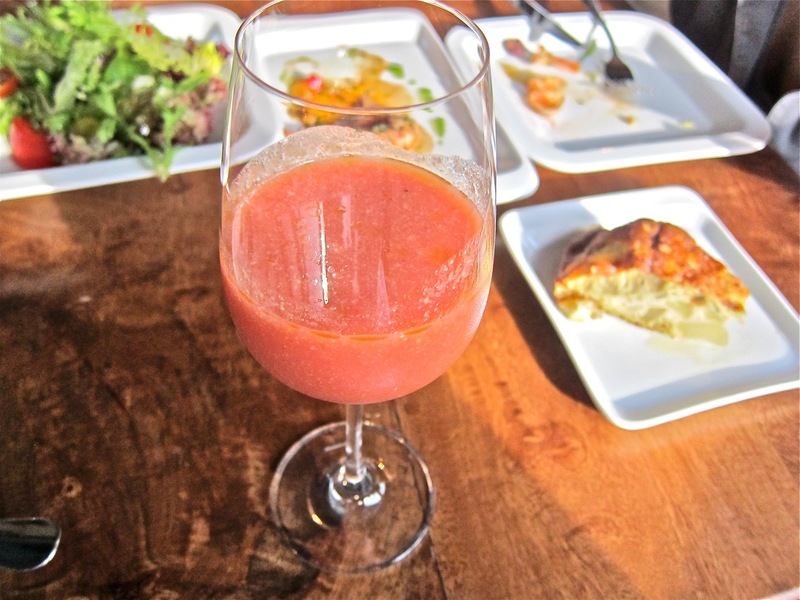 Then, I had the Gazpacho Andaluz, which is served in a wine glass (90 CZK). I drank up and was cheered up. The light, tangy soup had just the right balance of salt and vinegar, with a little meatiness from tomatoes, cucumbers, and peppers. 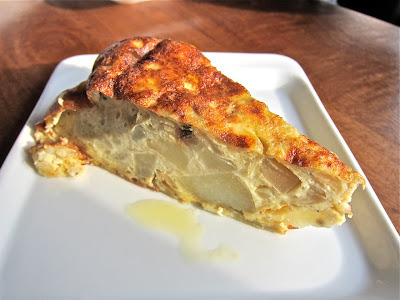 Then came another tapas classic, the tortilla de patatas (65 CZK). This was perfectly executed. 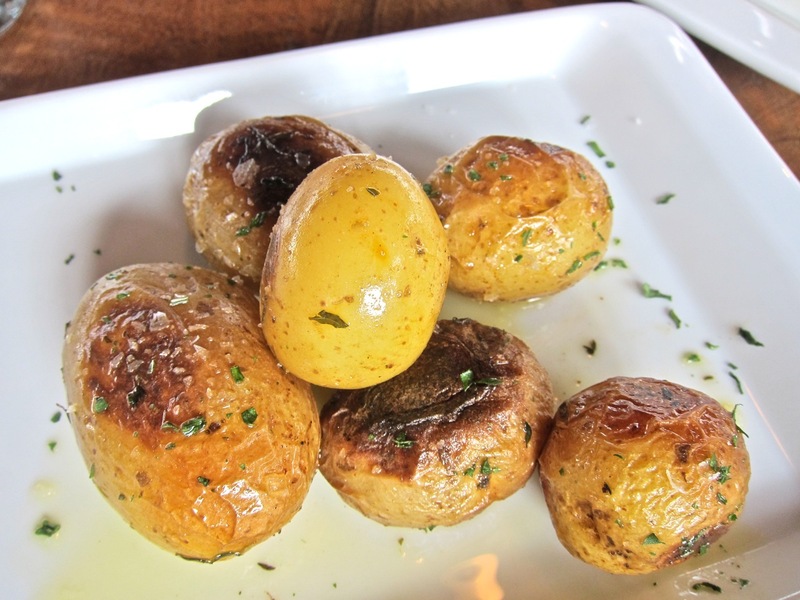 The light mix of eggs, potatoes, and onions was served steaming hot and it tasted freshly made. We had to taste the baked tiger prawns with garlic and chili (145 CZK). Delicately delicious. They varied in size from medium to small. After peeling off they shells, they quickly disappeared. I ended up sucking on the heads and mopping up every drop of the sauce with their nice bread. 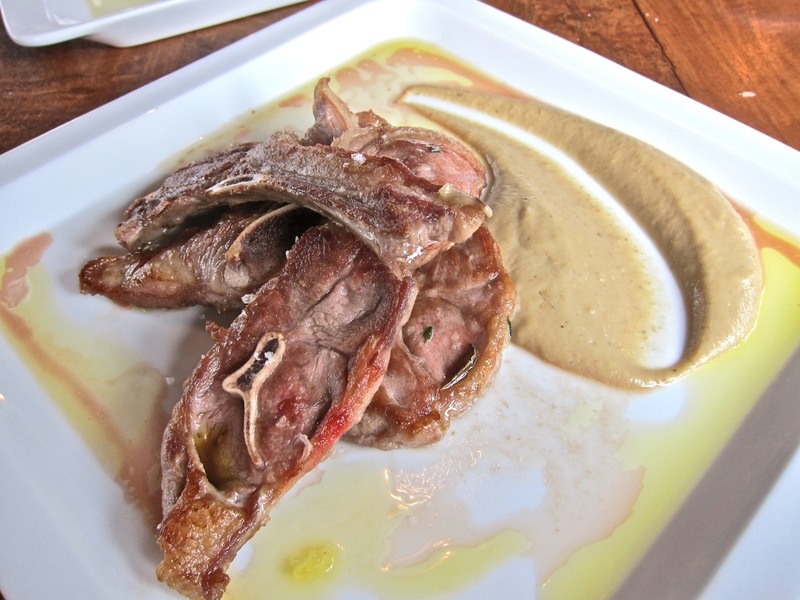 For a main course, I had the lamb chops (295 CZK). I told the waiter I wanted them medium rare, and he duly wrote it down, though I'm not sure why. These were the thinnest lamb chops I've ever had. They were cooked through and I couldn't imagine them otherwise. That said, I enjoyed them. There wasn't a large amount of meat, but it was very lamby and tasty. As I consumed it, fat and all, I thought of it as something akin to lamb bacon. 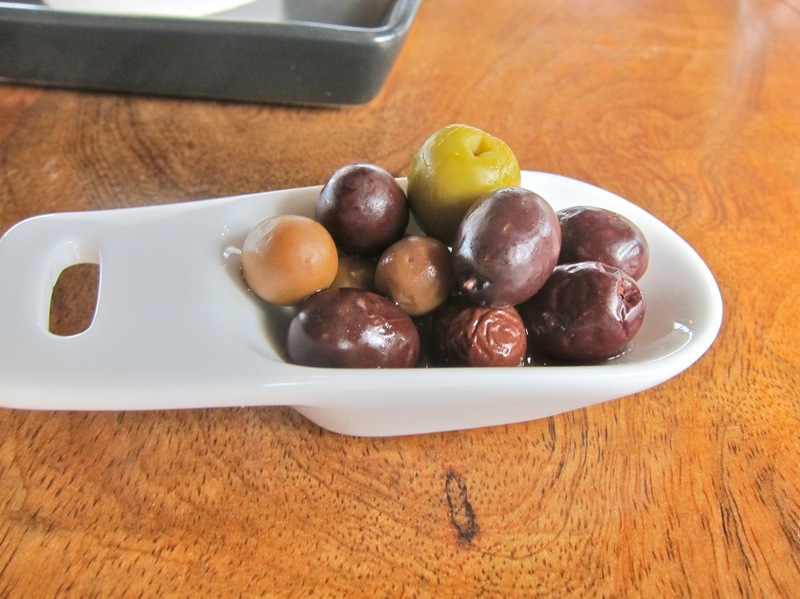 The aubergine puree, made with apples and wine grapes was a complement deserving of the highest compliments. It raised the plate to a higher level. To go with it, I had the baked potatoes (45 CZK). We both loved these golden, starchy little spuds. My date had the dorade or sea bream (360 CZK). The fish was fresh, but incredibly bony. We couldn't pick them out easily and half the bites yielded an unpleasant mouthful. Perhaps it was bad luck, but it turned us both off this dish. 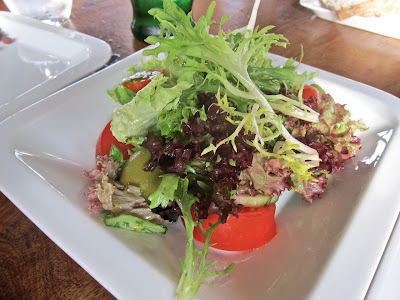 She had the Mediterranean salad on the side (90 CZK). Although it had a nice mix of leaves, it was very simple, underdressed, and overpriced. For dessert, I went for the Crema Catalana Cremada (85 CZK). 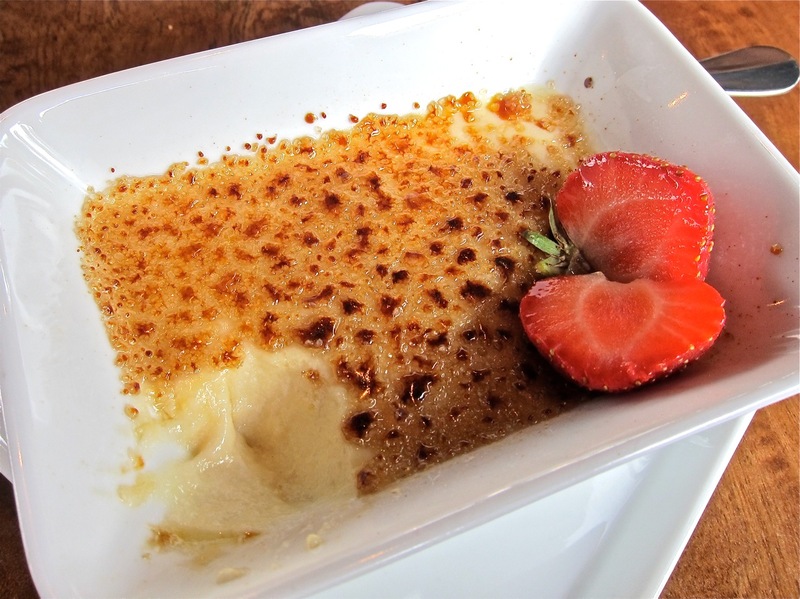 It looks similar, but it's quite different from crème brûlée. This version had a hint of cinnamon. The cream was not smooth, but had a texture I'd say was similar to apple sauce. The top layer was burnt, but not hard. The bill for this meal was 1950 CZK before tip. Did we like everything we tried? No. 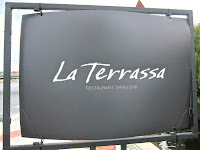 Would I go back to La Terrassa. Yes. There a number of dishes I'd have again. And again. The style, look, and location also left us with a good feeling. The service, though not flawless, was friendly and accommodating. I didn't consider all things great, but enough of the small plates were done with great love. Beautiful location, to be sure, and we had a great evening with friends, but the service and the food were both ho-hum. Nothing we ate caused us to pause and say, "Man, you gotta try this." It was all of a sameness. Now wow factor. Mussels were cold, fried anchovies and sardines were nice but predictable, plates of cheese and meat that are what they are. Our main courses never arrived. It took forever to get our wine. They need a few more waiters and more attention to the food that's coming out of the kitchen. 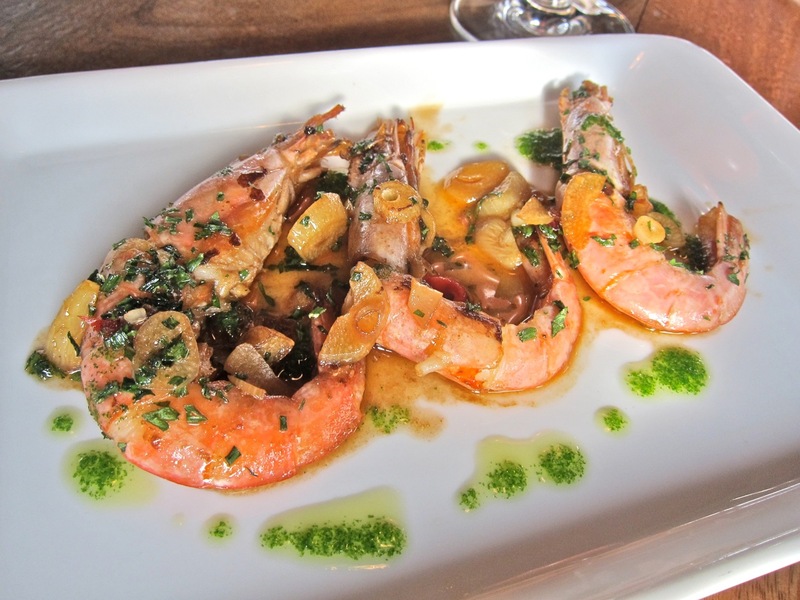 Great place, though, for a few bottles of wine and a few plates of grilled anchovies with no other expectations.